Balloon rocket is a simple science experiment to understand the newton’s third law. Which states that, “Every action has reaction”. You will build a simple rocket out of a balloon and a straw that will slide over a string by producing thrust. Precaution: Always wear safety goggles and hand gloves when dealing with chemicals. Also, take permission from your parents for the experiment, or involve them. Bring two chairs and place them 10 feet apart. Tie one end of the string with one of the two chairs. Pass another end of the string through the straw. Then, tie it with the second chair tightly, so that string tied between two chairs become flat. Blow up the balloon. Then, pinch its mouth with your hand, so that no air escapes from it. Tape the balloon with a straw while holding the mouth of balloon closed (ask your friend to help you). Just leave the mouth of the balloon, when you want your rocket to slide over the string. The air from the mouth of balloon rushes out. When you allow the air to rush out of the balloon, it creates thrust which propels rocket forward. So, how this thrust is produced? 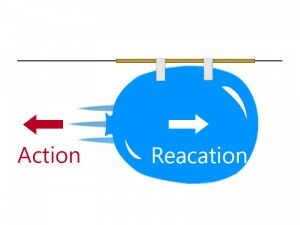 Actually, balloon forces the air to rush out of it which in turn pushes the balloon in opposite direction of air. That’s what the Newton said, “Every action has a reaction, which acts in opposite direction”. To summarize this all, if the air rushes leftward then balloon will propel to rightward. Use two same size balloons in place of one. Tape both balloons with straw in opposite direction and see what happens! Abdul Wahab, "How to Make a Balloon Rocket," in Science4Fun, April 13, 2019, http://science4fun.info/how-to-make-a-balloon-rocket/.